The hockey community has rallied around Chad Dlugolecki as he battles to beat leukemia. ST. LOUIS — A few weeks ago, Kevin Shattenkirk received the kind of news nobody wants to hear. One of the St. Louis Blues defenseman’s youth coaches, Chad Dlugolecki, was diagnosed with Acute Promyelocytic Leukemia (APL) on Jan. 2 and was hospitalized in Morristown, New Jersey. "It really just hit him out of nowhere," Shattenkirk said. Dlugolecki went to the hospital after not feeling well for a few weeks. 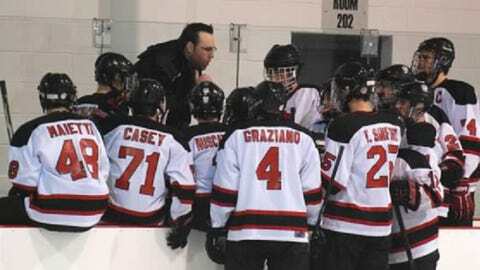 It didn’t take long for the 38-year-old coach with the New Jersey Devils Youth Hockey Club to find out what was wrong. APL is the same form of leukemia that Indianapolis Colts coach Chuck Pagano was diagnosed with in 2012. "This is my 20th day in the hospital." 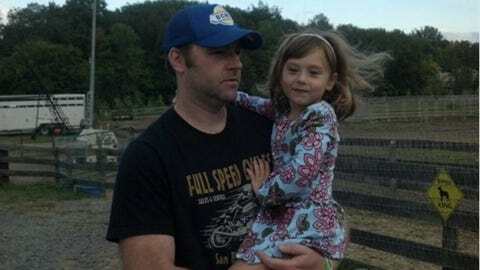 The hockey community both near and far rallied around his cause. A page was started on the website GoFundMe.com for people to donate money to aid in his treatment and word spread when NHL players that he had coached, including Shattenkirk and Kyle Palmieri of the Anaheim Ducks, posted links to the page on their Twitter accounts. "Chad, he had me when I was right around like 12-13 all the way up until I was about 16," Shattenkirk said. "Just a great, great coach. Good motivator. Very passionate about the game and someone that always made the game fun when we were younger and I think that’s a very important quality to have as a coach." Tweets from the Toronto Maple Leafs’ James van Riemsdyk, whose brother was coached by Dlugolecki, and the Chicago Blackhawks’ Patrick Kane, who had played on a U.S. national team with one of Dlugolecki’s assistant coaches, also helped the cause. Money started pouring into the site in support of the coach, quickly surpassing $5,000 and then $10,000. Before long, it hit $20,000 and $25,000. As of Wednesday afternoon, more than $32,000 had been raised in just 15 days. CLICK HERE to visit Chad Dlugolecki’s GoFundMe donation page. "It’s a great community," said Kelly DiNorcia, an administrator with the New Jersey Devils Youth Hockey club. "It’s a great bunch of people and they really want to help. When word started getting out and people found out, they were contacting us wanting to know what they could do. I wanted to give people an outlet to help express their concern so I checked with Chad’s mother, and she said it was fine to set up the GoFundMe site, so I did. I never ever thought it would raise the kind of money that it has." Shattenkirk made a donation and a $1,000 donation came in from a man named Jim Cooper "in honor of Kevin Shattenkirk." "Anyway you can help out it’s obviously nice," Shattenkirk said. "I know when that kind of stuff happens, the medical bills go through the roof. Hopefully it just takes a little bit of worry out of his mind and out of his family’s mind and it can just allow them to focus on recovery. I think there’s been a lot of support. I think, from what I heard a couple days ago, some of the youth teams were going to donate blood platelets for him. It’s just been a great, great effort and a quick effort that everyone’s been making to really rally around Chad and help him out." It has all been overwhelming for Dlugolecki and his family, including his parents, Walt and Linda. Because of his weakened immune system, Chad is only able to have a select few visitors at Morristown Memorial Hospital. Unfortunately, he is unable to see his two young daughters — Keira, 8, and Maria, 4 — but Walt and Linda have been there as much as possible. Dlugolecki’s parents have also noticed the amount of support for their son throughout the hockey community, which took them by surprise. In addition to the money that has come in, people have also donated blood in support of his fight. "You know how you think people like you?" Linda asked. "But at a time like this is when people come out and express it. He’s got kids that he has known 12-15 years ago that are contacting him. One kid went to West Point and he’s already been in Iraq and he was deployed, and somehow he found out and he called Chad. I just think he was astounded. That’s the only word I can think of — astounded and overwhelmed. Overwhelmed in a great way." Dlugolecki said he’s not a very emotional guy, but he can’t help it right now after seeing the outpouring of support. The past 20 days have been a whirlwind of emotions for him. In addition to coaching — this is his ninth season with Devils Youth Hockey — and teaching private lessons, he also grew up playing the game. He played on the Devils’ Junior team, in the USA Hockey Player Development program and also minor professional hockey with the Muskegon Fury of the United Hockey League, according to his bio on the youth hockey club’s website. He said he still gets on the ice whenever he can in a summer checking league. So the man’s toughness should never be questioned. He’s a fighter and he’s going to keep fighting through this. He’s got a great team and, as it turns out, the entire hockey community behind him. "It was tough," he said of his diagnosis. "It was pretty emotional. Going through this whole thing has been hard. But then once and a while I would check the site and it’s like one kid after another. And it’s not the families but the kids themselves that I coached. … It was pretty overwhelming." Dlugolecki wasn’t surprised to see Shattenkirk’s support. "Kevin, besides being a hockey player, you take that out, he’s a great person and he always has been," he said. "He’s been a leader when he played youth hockey, with the U.S. National team, at BU (Boston University), all the way up. He’s always been a great kid and he came from a good family." You can mark this one down in the win column for the hockey community. "It’s a strong community down there and everyone knows someone, so it’s good to see everyone pitching in," Shattenkirk said.